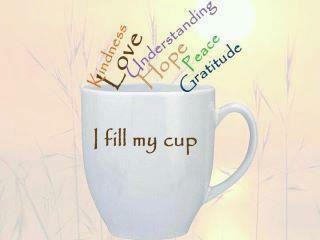 Add Gratitude To Your Coffee! Adding gratitude to our day should be as easy as adding sugar to our coffee, and it would be, will be, if we practice it more. That is what the challenge is all about! Practice adding gratitude to your day and after a while it becomes easier and easier, before you know it you have a habit that is as easy as breathing! I know some of you doubt that could be true but it is, I am proof of that. There was a time when I would wake up and wonder what it was that I needed to worry about today. I can remember a time in my life when Sunday was the day for fighting with my husband! I can actually remember being very conscious of the fact that it seemed we waited for that day to fight….it was weird! And weirder still was the fact that even though I became conscious of the fact I did not change it! Don’t tell me we didn’t want to fight! So yes, I am proof that learning to practice gratitude can become second nature to you and it only takes the first step of beginning! That is what the Gratitude challenge is all about! This entry was tagged gofundme, gratitude, gratitude challenge, gratitude project, love, writing. Bookmark the permalink. Learning to add gratitude to your day can be as easy as adding sugar to your coffee! What is happening at the Gratitude Diva?